Come visit Tazewell County's historic rural sites and small towns to rediscover life the way it used to be. Become immersed in nature's grandeur as you wander off the main roads. Walk through the world's oldest exhibition coal mine and its fascinating company town. 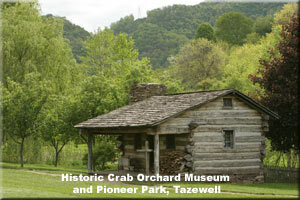 Enjoy a pioneering experience in a reconstructed pioneer settlement and museum, the Historic Crab Orchard Museum and Pioneer Park.